Check out below for more information on starting your summer! Looking for more classes? Hurry, limited spaces still available! Welcome to Summer Connections (SC) 2018! We are looking forward to an exciting and engaging summer full of fun and exploration! Our faculty and staff are eager to meet our newest campers and welcome back our SC family. We hope to make your child’s transition into the summer program a smooth one. This summer will be filled with adventures in art, music, movement, sports, culture, and memories for years to come! We can’t wait to get started! Week 1 (June 25 – June 29) we will be learning about North America as part of our Passports around the World program. For drop-off and pick-up information, schedules, and more click here. Drop-off and pick-up take place at Upper Campus, near Umpleby Hall. Please do not drop off before 8:00 AM. For the first day of each week, there are new parents discovering our campus. We advise you leave a few extra minutes to navigate the campus. Parking is available in the lots on Upper Campus. Please click here for a campus map. Help us keep our campers safe. Enrichment, Scholars and Immersives Families are asked to enter campus from our N. Woodland entrance. It is important to know we strongly discourage the drop-off of children on the public streets, especially the southern side of E. Palisade Ave. or N. Woodland St. The safety of our students are our utmost priority; crossing busy streets to enter campus during morning hours in particular is a concern. And we suggest parents/guardians to allow for a bit of extra time and patience during morning drop-off and afternoon pick-up of your children throughout the summer here at the D-E SummerConnections program. 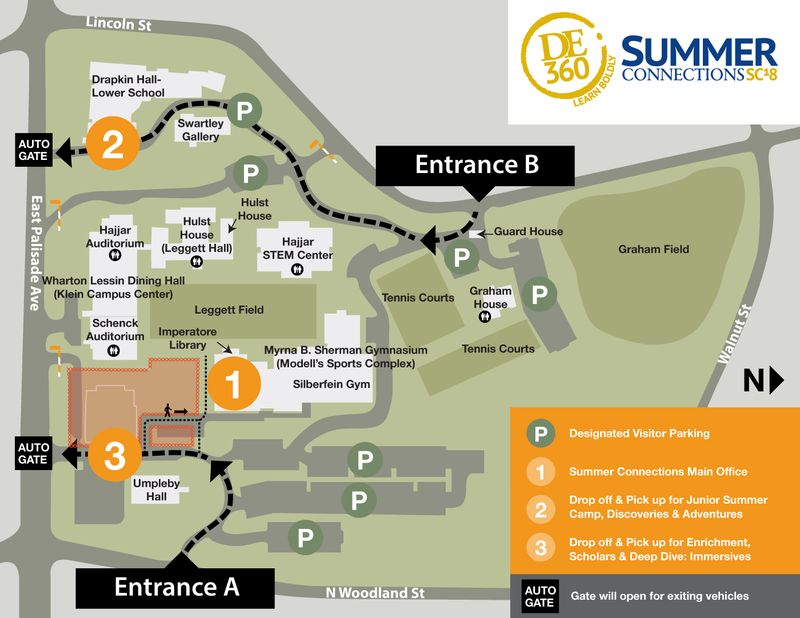 The campus map will help you to locate buildings and/or fields: click here to view. Please note, the Dwight- Englewood School campus is currently undergoing construction. There are signs and lamppost banners throughout the campus to direct you to the correct buildings. Classrooms and fields location information for all classes can be found by clicking here. Food: On-campus food purchasing is available in Klein Campus Center (ground floor) located in the Wharton Lessin Dining Hall (cafeteria) for breakfast, lunch, and snacks. Students may also pack their own food. Make sure all your required Health & Medical Forms are completed for all campers. To access and complete these Forms please LogIn to the D-E360° Summer Connections Campbrain system: click here. Forms must be up to date, completed, and submitted online or to the D-E ° SC Office by the time your child arrives on campus. All forms are necessary, even if your child attends D-E during the school year. If your child requires medication during the day, please indicate that on the medical forms that must be signed by your child’s physician. Do not send any medication to camp with your child. Please contact the Health Director, Holly Alasio, regarding procedures for medication administration. To reach the Director of Health to discuss any SIGNIFICANT ISSUES, you can call (201) 227-3144 option 2. If you have medications that should be administered during the day, please fill out the “Permission to Treat” Form. Please apply sunscreen at home each morning and/or pack sunscreen with your camper(s) before Drop-off. Stay hydrated! Water stations and drinking fountains are located throughout the campus. Questions? Call Holly Alasio, our Director of Health, at 201-227-3144, option 2. We want to be a part of your Summer ‘18 experience! Don’t forget to share your summer experience with us! Ask any D-E 360° Summer Connections teacher or staff member, or “blueshirt” Teaching Assistants and Counselors. We are here to help! ← 1 Week Away & Counting!